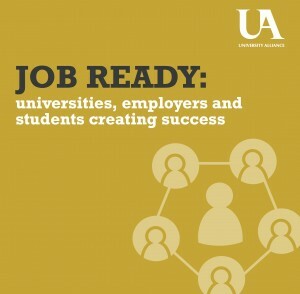 Our latest report, Job Ready: Universities, employers and students creating success, is based on in-depth interviews with small and large employers, including British Airways, IBM, Marks and Spencer and Bank of America, showing employers are putting graduates at the heart of their strategies to innovate and grow. Download the report here or visit our Job Ready campaign site. The report is based on extensive and in-depth interviews with over 50 employers around the UK and captures a snapshot of the 21,000 interactions with business that Alliance universities undertake each year. The interviews show that employers are demanding more from their graduates with modern jobs increasingly requiring employees to be forward thinking, problem solving and entrepreneurial. It is clear from the interviews that universities are good at preparing students for this future reality, but that it works best when they partner with employers. The report highlights that a partnership approach between universities and employers helps to ensure course content, and therefore skills learnt, are relevant and kept up-to-date and can be flexible to change alongside the changing demands of local labour markets. Alliance universities undertake considerable collaboration with employers. Half of all sandwich courses – where a year or more of a course is spent outside of the university, working directly for an employer – are delivered at Alliance universities where up to 70% of courses are professionally accredited. “Universities are stepping up to the challenge of working with employers to produce job-ready graduates. When it comes to both the quality and the job-readiness of our graduates, Alliance universities are competing with the best in the world. This comes down to our deep commitment to deliver excellent practice-based learning for our students giving us the reputation of being the leading employer-facing universities. “From major blue-chips down to small, rapidly- innovating businesses, the interviews we have undertaken demonstrate that employers value this approach. And we know that students value it too, with our hugely oversubscribed leading degree programmes that are attracting outstanding students and delivering some of the most exciting graduate employment opportunities. is in graduate-level jobs, those involving analytical, problem solving and complex communications, it is important that we ensure universities are working closely with employers. of ways to help develop employability skills and capabilities of students. – Alliance universities are proactively bridging the gap between the academic and the corporate worlds. – employers and universities need to continue to develop relationships to ensure open communication, so that both parties understand the others’ needs and capabilities. – Alliance universities are ensuring their students gain the best employability skills on top of their degree – this means developing excellent core capabilities and strengths alongside resilience and an enquiring mind. the university – from the careers department to individual faculties and with specific academics who share their business interests and can help them to identify sector-specific talent and opportunities.